Best-selling authors are all about drawing their readers into vivid scenes. So let’s return the favor for Claire Cook, currently riding a cresting wave with her seventh novel “Seven Year Switch”, winner of the Fiction Category, as well as the Grand Prize, in this year’s annual Beach Book Festival. Far from the sandy shores and swimming pools of America, where thousands of readers will take to heart the “Beach Read Shout Outs” by People Magazine, USA Today, The New York Times and The New York Post, and crack open Cook’s latest charmer this summer, Claire remembers a cold, wintry New England day ten years ago when the lifelong dream she is now living took wing. The wife and mother of two was in her mid-40s, sitting in her minivan outside her daughter Garet’s swim practice at 5 a.m., heater running full blast, when it hit her that she might live her whole life without ever once going after her dream of writing a novel. For the next six months, she sat there day after day, writing a rough draft in the pool parking lot on a yellow legal pad; she thought the idea of getting a laptop might jinx her, like an aspiring business person printing cards before they’d worked out a business plan. Featuring a ditsy protagonist, “a woman drowning in a sea of swim moms, perhaps the person I was afraid becoming,” “Ready To Fall” sold to the first publisher who asked to read it. Her second novel went to auction, earning her sixteen times her annual teaching salary. At 50, the minivan far behind her, she walked the red carpet at the Hollywood premiere of the feature film adaptation of her second novel, “Must Love Dogs”. Adapted and directed by “Family Ties” creator Gary David Goldberg, the movie starred Diane Lane and John Cusack. “The Wildwater Walking Club”. Beyond that, however, the author’s incredible success story in midlife has inspired thousands of her fans to look to her as an inspiration for their own long-deferred dreams. 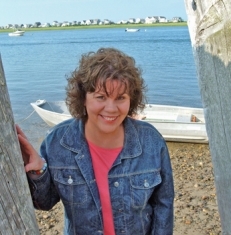 Reflective of her personal journey, many of Claire’s lead characters are on searches for their own next chapters, often with an entrepreneurial twist: travel and cultural coaching and cooking in “Seven Year Switch”; buyouts and lavender and clotheslines in “The Wildwater Walking Club”; makeup in “Summer Blowout”; and sea glass jewelry in “Life’s a Beach”. The author’s fans are invited to tell personal stories of their own gear-shifting lives in the “Reinvention” page of her website, as well as on Facebook and Twitter. As part of her book tours, Claire also conducts free “Reinvention Workshops” across the country, which developed out of free writing seminars she conducted as a way of giving thanks to her readers. In 2009, The Today Show did a segment on these events. In a world that is increasingly full of gloomy and depressing news, short attention spans and way too many multi-media distractions, Claire’s success with novels like “Must Love Dogs” and “Seven Year Switch” proves that people still seek lighthearted escapism (as long as it makes them think) and, perhaps even more surprisingly, have time to read a several hundred page novel. “It’s easy to be dismissive of this genre I’ve tapped into, the so-called ‘beach reads,’ because the things I write about are not earthshaking,” she says. “But there’s plenty of pain and suffering in the world without me adding to it. If my readers have two weeks off per year, I want to give them stories that will inspire them in their own lives, and make them feel better, not worse. Had Claire never put pen to legal pad inside the minivan, her life would still have been interesting enough to…let’s say, become the story of one of her cherished characters. At the time she started writing, she was a teacher at an artsy private school and a consultant at two others, introducing “fun and funky” activities like open ocean rowing and rollerblading for middle-schoolers, and literacy through movement activities for younger students. Her efforts won her school the Massachusetts Governor’s Fitness Award for innovative programming. Even with all that, she felt she was hiding from what she really wanted to do with her life. “It didn’t happen,” Claire says. “I guess I knew how to write, but not what to write. Looking back, I can see that I had to live my life so I’d have something to write about, and if I could give my younger self some good advice, it would be not to beat myself up for the next couple of decades. But I did. At the same time, I pretended I wasn’t feeling terrible about not writing a novel and did a lot of other creative things. I wrote shoe ads for an in house advertising agency for five weeks, became continuity director of a local radio station for a couple of years, taught aerobics and did some choreography, helped a friend with landscape design, wrote a few freelance magazine pieces, took some more detours. Eventually, I had two children and followed them to school as a teacher, where I taught everything from multicultural games and dance to open ocean rowing to creative writing.